Activities are generally assigned according to age group; group scheduling allows campers to develop social skills, and to have fun with their best friends. We recognize that everyone has strengths. By participating in activities with their peers, campers shed their inhibitions, form strong bonds with each other, and gain confidence and ability in activities that they might not have ever tried before. Counselors who are specialists in their fields always supervise all activities at camp. Because of our instruction, professional approach to teaching and our spirit (!) campers can expect to become better ball players, swimmers, actors and musicians. We offer an all-around sports program to encourage healthy competition. Instruction is built into every activity. This enables campers to develop self-confidence and learn leadership skills. Our facilities – sports fields and an indoor gym — are filled with activity all day long. Boys play baseball, basketball, lacrosse, soccer, roller hockey, flag football, ultimate frisbee, and beach volleyball. We arrange for those campers who choose to, to participate in tennis matches and athletic tournaments. Our campers enjoy visiting other camps nearby and hosting camps here, too. Inter-camp games and tournaments are for campers entering the 6th grade and up. Campers at all ability levels can participate in inter-camp games that we arrange with nearby camps. They can try out to play on tournament teams in soccer, basketball, baseball and hockey. For many campers, tennis is the focal point of camp. The program is run by a tennis pro who has been working at camp for many summers. 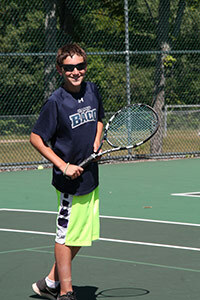 We offer tennis instruction to campers, where they focus on skill building, drills and practice play. There are eight tennis courts at Camp Baco. In addition to intra-camp games and tournaments, campers enjoy participating in inter-camp tennis tournaments and USTA hosted tennis tournaments. Private lessons can be arranged for campers with our pros for an additional fee. Our pioneering program takes full advantage of our beautiful mountain surroundings. Specially trained counselors guide campers on age-appropriate hiking trails throughout the Adirondacks. Campers learn how to hike safely and smartly while enjoying the wilderness. In addition, campers learn camping skills on overnights. The climbing tower located at Camp-Che-Na-Wah is used by campers from both camps and supervised by certified counselors. Scrambling up the tower and rappelling down are skills that test a camper’s strength, agility and courage, as well as their Spiderman genes. Older campers enjoy our high ropes and zip line course. Situated at Camp Baco and supervised by certified counselors, campers enjoy acting like tight rope artists while taking in the magnificent view of the mountains from the top of the tightrope. Not surprisingly, high ropes are among one of our favorite activities at camp. We think that some of the best things about camp are the most unexpected and old-fashioned; and campers of all ages enjoy trying to hit bull’s-eyes at the archery range. Archery helps them feel strong and focused, plus, it’s pretty fun. Senior boys enjoy heading to the open-air pavilion, with a full suite of weight-training equipment. Our beautiful lake is the heart of camp. 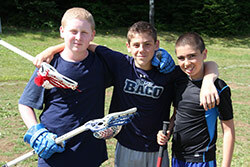 Baco has a fully equipped waterfront on Lake Balfour, where campers cool off and have fun every day. Every camper receives swim instruction through the Red Cross “Learn to Swim Program.” Our Red Cross-certified instructors teach campers swimming, diving and lifesaving techniques to develop confidence and a life-long love of the water. Older campers can participate in Red Cross certified water safety courses specially designed for lake swimming. 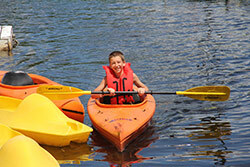 Campers love our boats and they learn boating skills on canoes, kayaks, and funyaks and sunfish sailboats. Bobbing along on the lake, learning boating safety skills and how to handle a lightweight sail boat are all skills campers can carry with them for a lifetime. Waterskiing is one of the most popular activities at camp and each camp has its team of certified Water Safety Instructors and its own “Ski Nautique” ski boat. Leveled according to each camper’s ability, our instructors get campers up on skis and confidently circling the lake in no time! We also offer skim boarding and wakeboarding, which the children say is almost more fun that waterskiing. What would camp be without free swim in Lake Balfour? Every day, campers can enjoy a free swim period where they bob with friends on floats and noodles, leap off the diving board or practice what they learned in swim instruction that day! Creativity is a hallmark of camp and campers are given ample opportunities to immerse themselves in performance activities and in Arts & Crafts. We have indoor and outdoor theaters at both camps – they’re entertainment hot spots – great for shows and concerts; our arts and crafts pavilions are among the favorite spots at camp for campers of all ages. 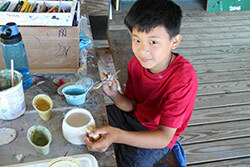 Campers enjoy such activities as drawing and sculpting, beading and tie dying in our arts and crafts buildings. We have pottery wheels and kilns for campers to try their hands at making pots. Campers adore Arts & Crafts, not only because the activities are just plain fun, but because of the buildings themselves: Baco’s arts and crafts pavilion has a creation station on a balcony overlooking the lake. Campers of every age participate in our musical theater programs, which are run by musical theater and dramatic professionals with Broadway production credits. For children who choose to perform in plays, there is a junior show, an intermediate show, a co-ed senior show and, for our oldest campers, “The Big Show,” also a co-ed production where boys and girls rehearse and perform together. Campers who play an instrument can bring theirs to camp and participate in the rock bands we form. Our music program, taught by counselors who are musicians, help kids learn to play in rock ensembles, culminating with a performance in front of their camp friends. It seems as if everywhere you go, you hear music. Summers wouldn’t be complete without special excursions off camps’ grounds. In our camp-owned buses and vans, we take campers hiking, and to bowling, and mini-golf. A favorite excursion is to a few of the local amusement parks in the Lake George area, too. “Mini-Camp” is an elective program that includes options such as: intensive workshops in basketball, arts, soccer, tennis, swimming, day hikes, overnight hikes, local sightseeing trips at no extra cost. The “Mini-Camp” program also includes the option of a co-ed trip at an additional fee. Campers in our senior age division can choose to travel out of camp on one, two and three-day trips to Boston, Vermont or Montreal to sight see and have fun being tourists. These trips are co-ed and chaperoned by senior staff; boys and girls take separate luxury buses and stay safe on separate floors of the hotels. These trips require an additional fee. Baco boys and Che-Na-Wah girls enjoy numerous age appropriate activities together throughout the summer to share in camp spirit. These include our Fourth of July celebration and talent show, the Baco/Che-Na-Wah charity bazaar and our end-of-summer dance with a DJ. Brothers and sisters get together for a visit ever Saturday after lunch at one of the camps. The location rotates on a weekly basis.